We are in the middle of the mediterranean sea, the water is rough because there is a storm blowing. The storm will bring floods to Italian mainland during the night and the following day, but I don’t know this yet. It’s our first night onboard the Grande Europa, a cargo ship that transports vehicles around Europe and now us. The boat is moving from left to right as the engine purrs below deck to keep us moving east. It’s making me feel slightly nauseous because we are in our cabin without windows so I cannot keep my eyes on the horizon. The pill I took half an hour ago is not yet working, we bought it in Salerno the day before we boarded the ship. It’s huge, the boat and the thought that the waves and wind can make this much metal move is an incredible thought yet it doesn’t help in falling asleep. We had an amazing dinner prepared by the onboard Italian chef but I’m really scared it might want to come out. I close my eyes harder in the hopes of drifting away soon. After 15 more minutes the subtle sounds of the engine and the workings of the medicine send me off into a deep sleep. We will be sailing with this Grimaldi ship for about a week, from Salerno, Italy to Ashdod in Israel. It is the only way to get to Egypt without flying when the civil war in Syria is making that route unsafe. It’s not a ferry, let me be clear on that. 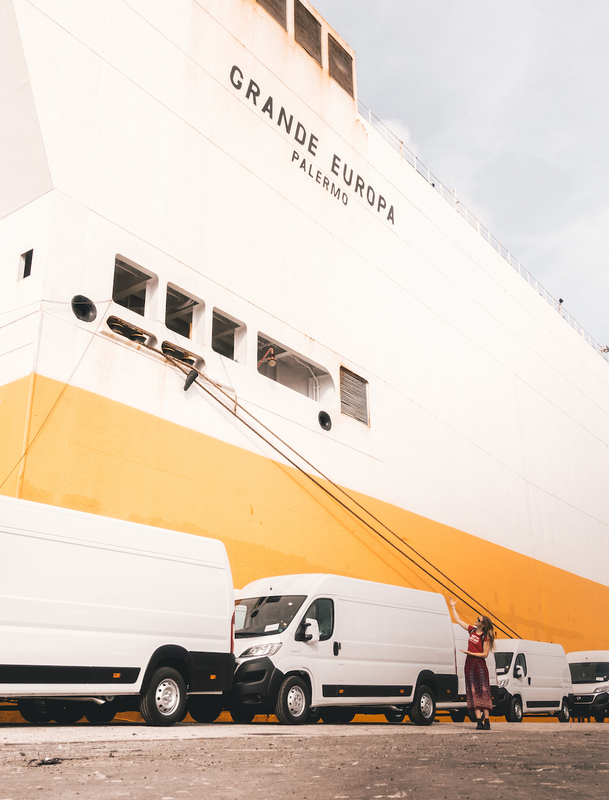 It’s a business that on the side will take passengers on board that want to travel with their vehicle or as an alternative to a cruise like our co-passengers Philippa and Stephen, a retired couple from the UK. We share all our meals together with them in the officers canteen, 3 times a day, fresh and simple Italian food served by the mostly Philippino crew. Every meal appears to include at least pizza or pasta, even for breakfast but I enjoy the meal times where we spend time talking about any topic imaginable with our new friends. When we do not eat, we work on our computers, editing and writing the day away. A common break is a walk on deck to check out where we are and what we can see. The first night we pass through the Medina straight on our way to Greece where we stop for 24 hours and get ashore to have our passports checked and to load and unload the vehicles. Our taxi driver in Greece was amazing! Next, we set sail for Limmasol, Cyprus. The schedule is loosely known, but the shipping industry is notorious for its delays and unpredictability. So we go with the flow and occasionally check in on the bridge with the captain or the first mate. After 5 days on board we reach Ashdod but as we arrive Friday night late the Sabbath has already started and this harbor proudly markets itself as the only port in the world that doesn’t operate 24/7. Sailing with the Grande Europa and Grimaldi was incredibly relaxing, the crew super friendly and not that expensive at all. I highly recommend it if you don’t mind being cutoff from internet for a few days and are willing to be flexible. In the next story we will share the import procedure at the port and what we did in Israel.